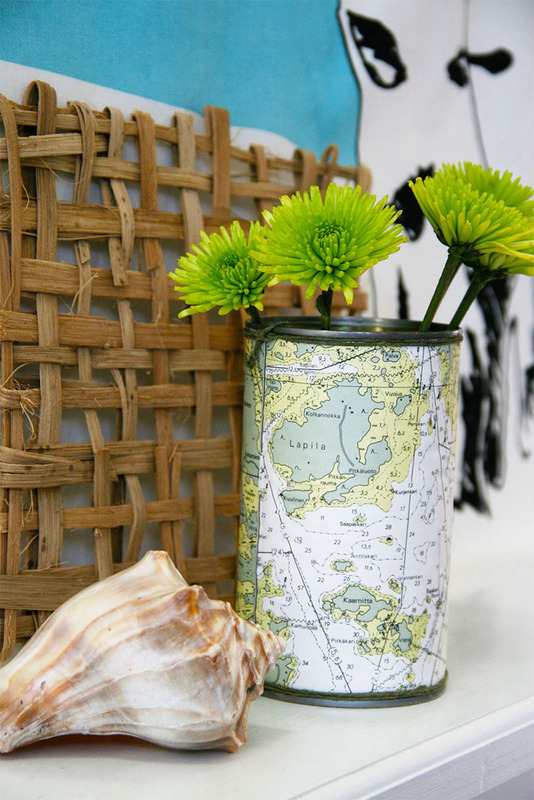 One of the easiest and most effective ways to stamp your own individuality and personality into your home is through map decor. Maps look awesome, they are easy to get hold of and by using maps of special places they can personalize and add the wow factor to an otherwise mundane object. I keep maps from all my trips and holidays for crafting. I have a draw full of tourist maps of cities I’ve visited, out of date road maps and even piste maps from previous ski holidays. If I can’t find the map I want for a particular craft then I either look on ebay or Cavallini do an awesome range of map wrapping papers. 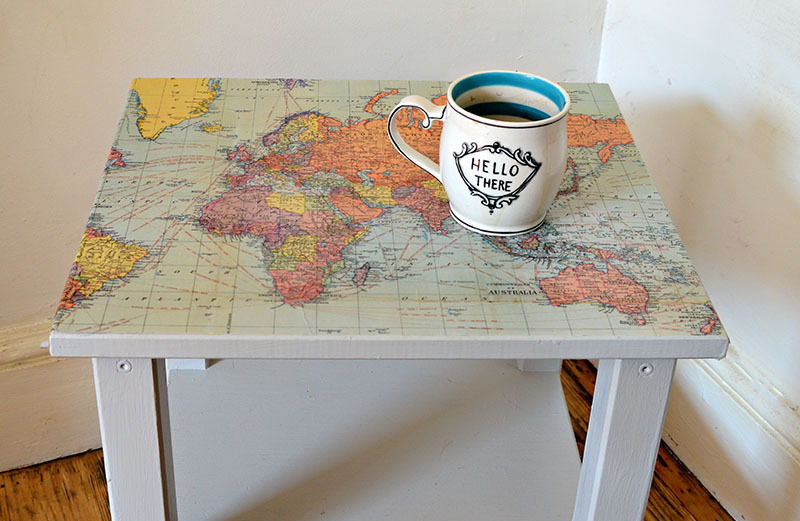 This is definately a great example of where a map has vastly improved a rather boring side table. It’s an Ikea hack too and one of my most popular pins. 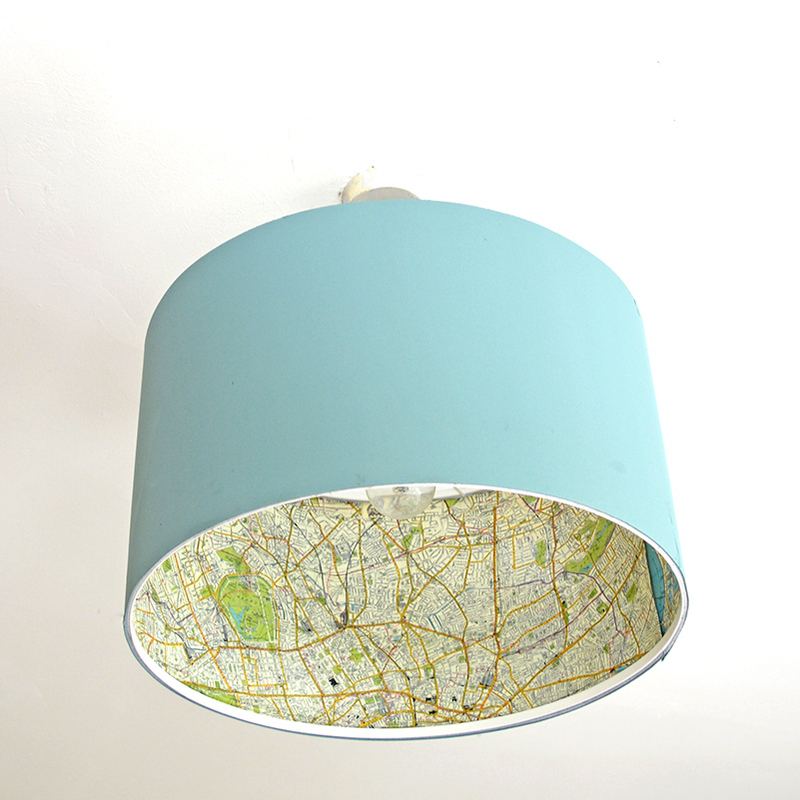 How about this for a great bit of map decor, turning an old globe into 2 pendant lights. Don’t have an old globe, then just get a lampshade kit from Ikea and make your own map lampshade. This one is made with Cavallini London Map, wrapping paper. 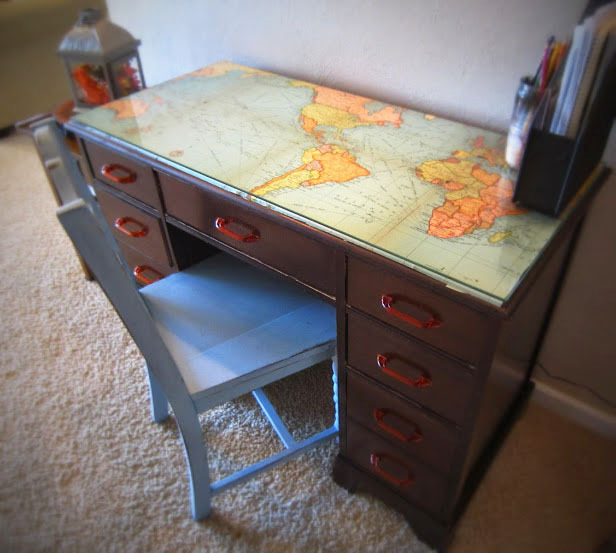 Add interest and character to an old desk with a vintage map. You can also look at it and daydream about future travels when you’re bored with work/homework. You are going to want a chair to sit on at your desk. 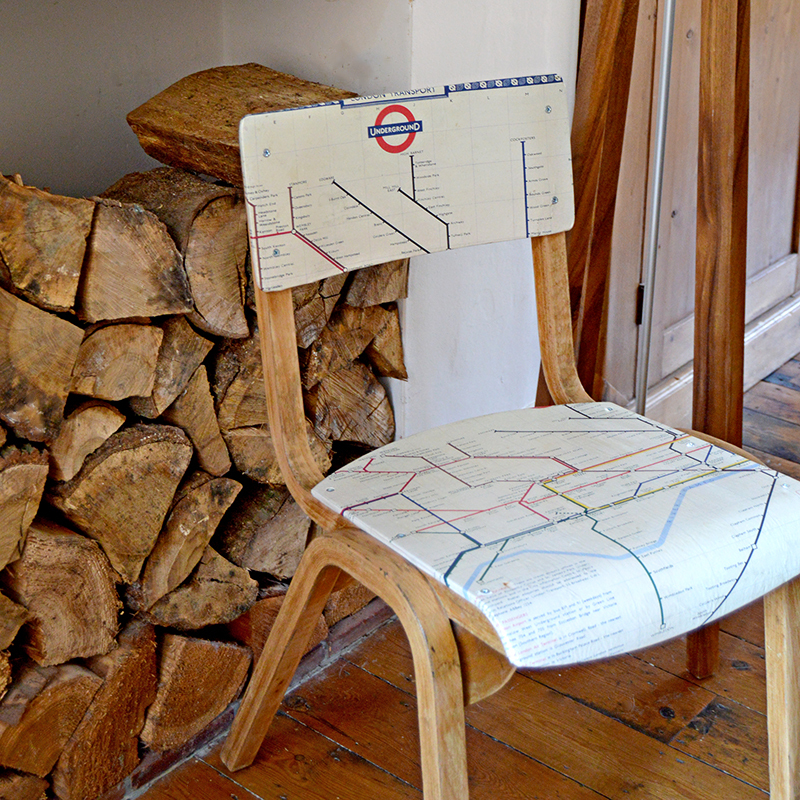 How about one with a map of your favourite place, such as this London Tube map chair. 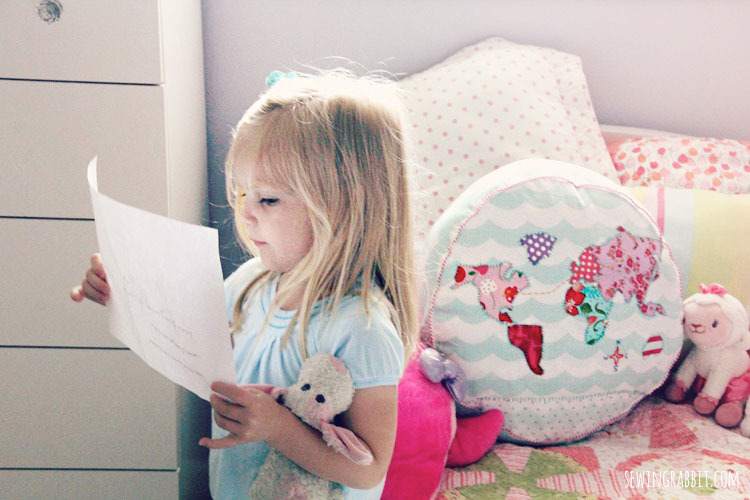 A great tutorial to make this gorgeous Map Pillow which would look lovely in any room. 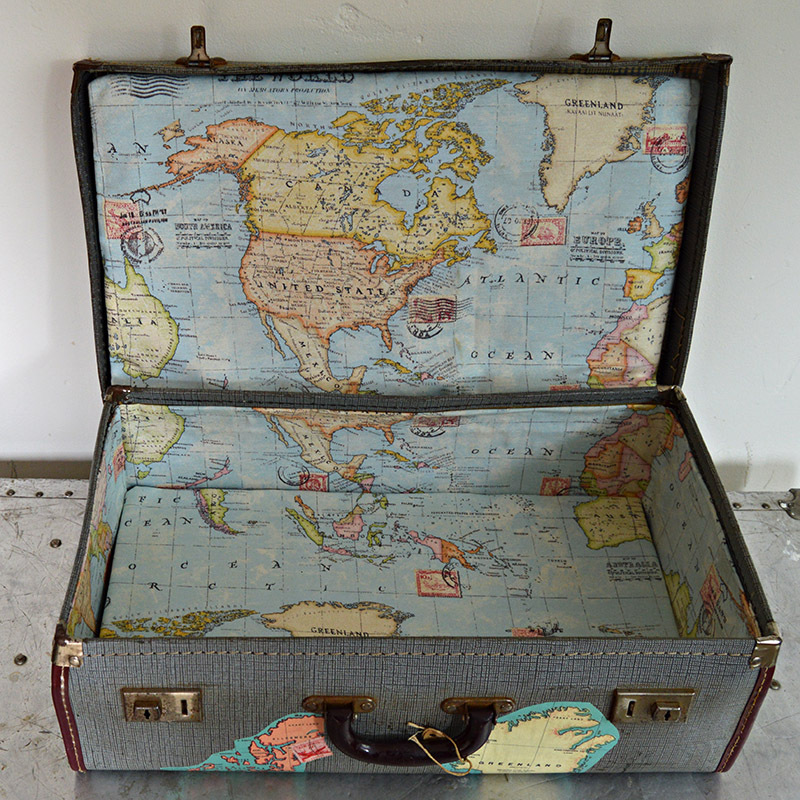 Want some funky storage for your home then transform an unloved old suitcase with maps. 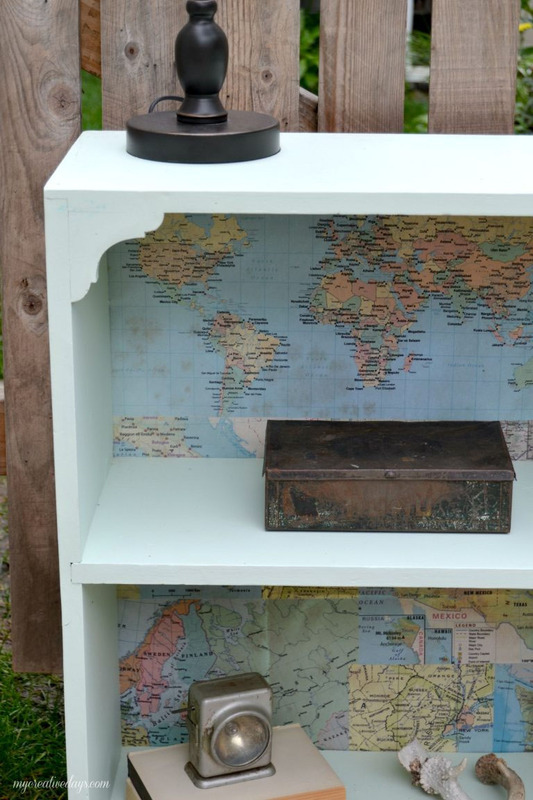 You can decoupage the outside and line it with some lovely world map fabric. Unfortunately this isn’t a tutorial but a chest of draws for sale. 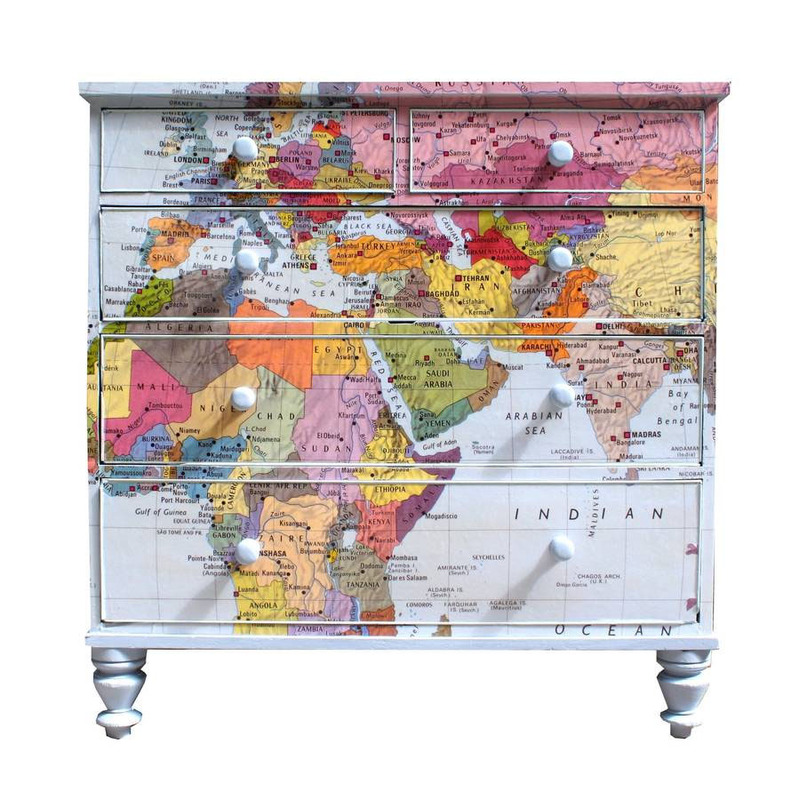 I thought it was such a stunning example of a map furniture decoupage, I just had to include it. 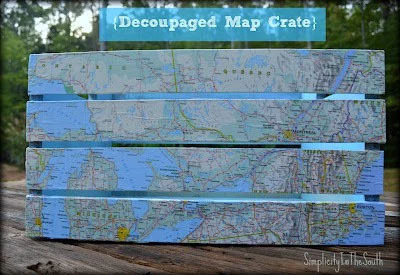 If you follow other map decoupage tutorials you should workout how to do your own. This is a really easy way to make a stylish planter/vase or pen storage. 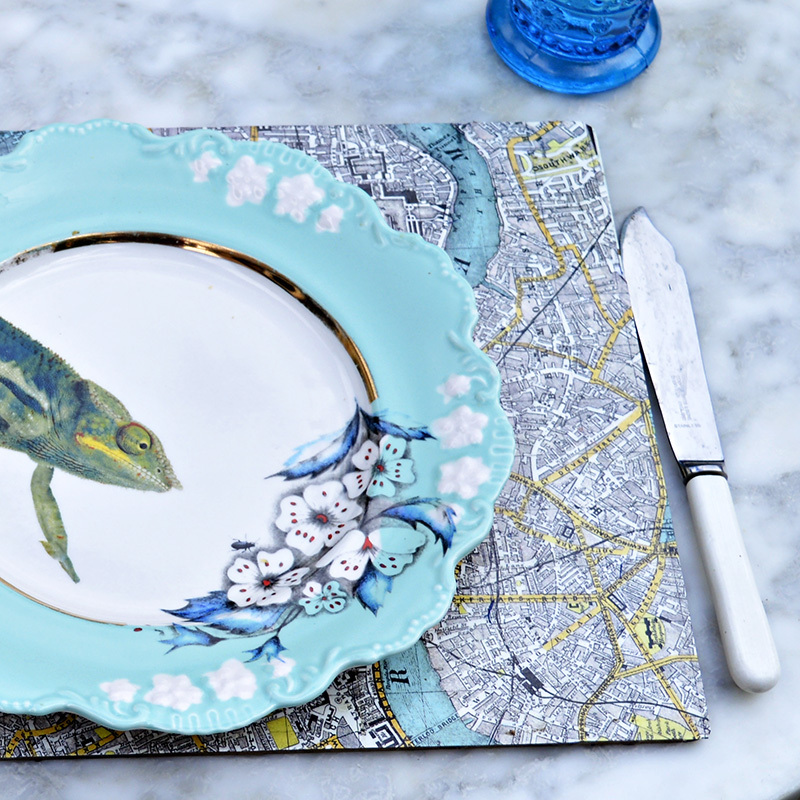 This is a great way of creating a personalised talking point by upcycling placemats / table mats with maps of your favourite cities. It really does spark conversation round the dinner table as you reminisce about your favourite city breaks. They also help create a stunning table scape. As maps are such lovely things to look at you could of course just frame them and put them on the wall. 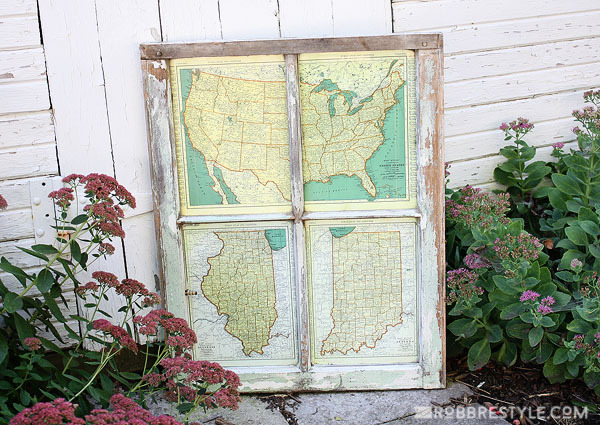 I love the way this old map is framed in a window. If the chest of drawers is a bit too much map you can always go for a more subtle approach and just line a bookcase with them. 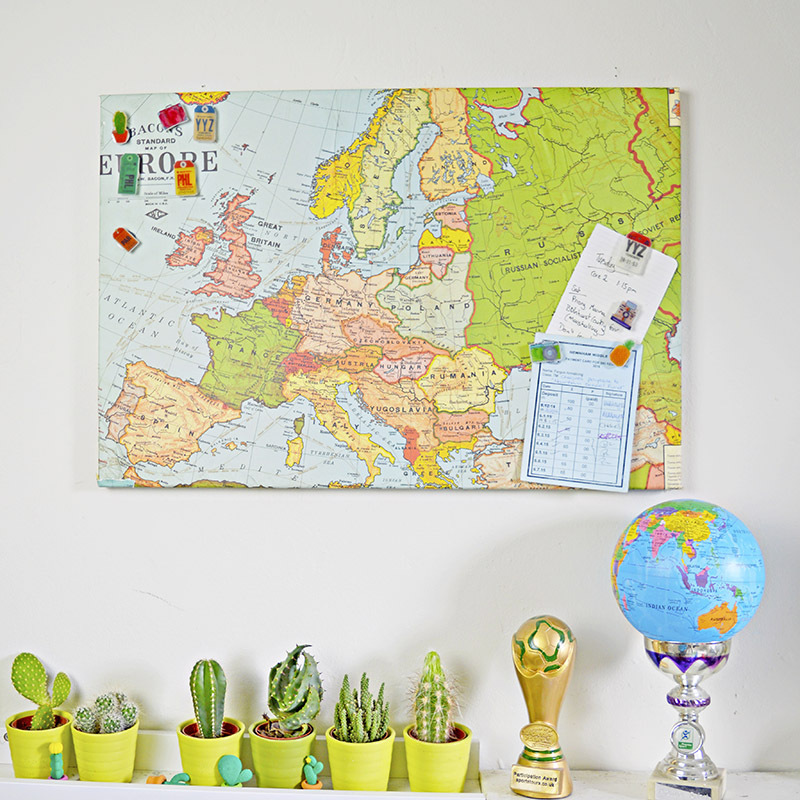 Personalise initial letter decorations further by covering them with maps of the places where you were born. Create some good looking storage by decoupaging a wooden crate with maps. 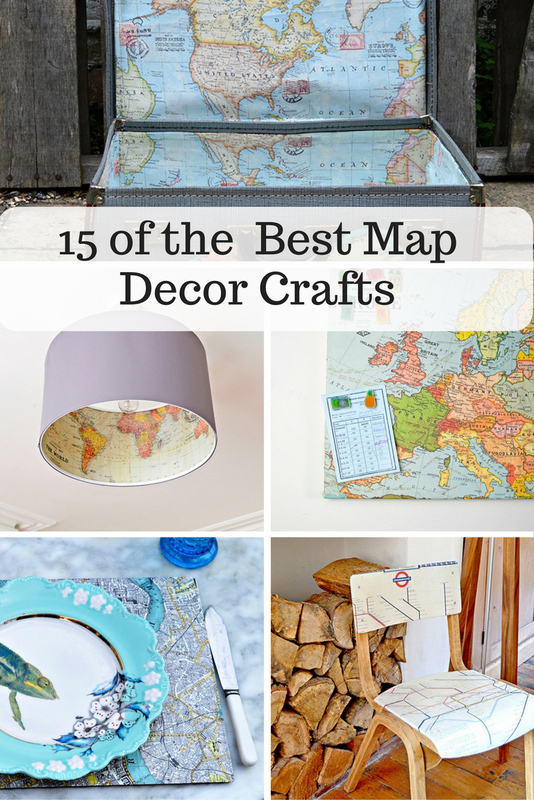 So many good map decor crafts to choose from its hard to pick a favourite. I know I have some in my home already but I would love them all especially that chest of draws. If you want more ideas I have a really good Map Crafts and DIY pinterest board. Have a great day, and see you at the next party! 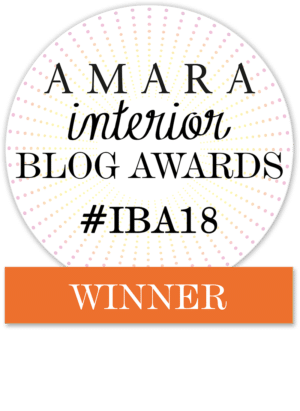 Thank you so much and thanks for the feature. Claire this is such a great roundup. You know that I am a fan of map decor as well, so this is like a kid being in a candy shop. So many great ideas for inspiration. I love your map crafts! While thrifting today I was looking for a suitcase to start on a map project. No luck just yet but I will keep looking. Thank you for sharing with us this week at Celebrate Your Story, have a great week. Thank you, and good luck with the suitcase hunt. Oh maps are my weakness. This is a great round up of inspiration for future projects. Thanks. Thank you, I know what you mean I can’t resist a map. A great selection of Map ideas. Really who doesn’t love a map being used. I love them all but I think my favorite is the inside of the lampshade. Thank you ! The lampshade is very popular. Thank you, the lamp is the most pinned one. great roundup! Love map projects! They are all great ideas, but I think the insides of the lamp shade and the suitcase are my favorites! Thanks for sharing on the Pleasures of the NW’s DIY party! Thank you very much, I love the suitcase. Oh Claire, what a fun round-up! 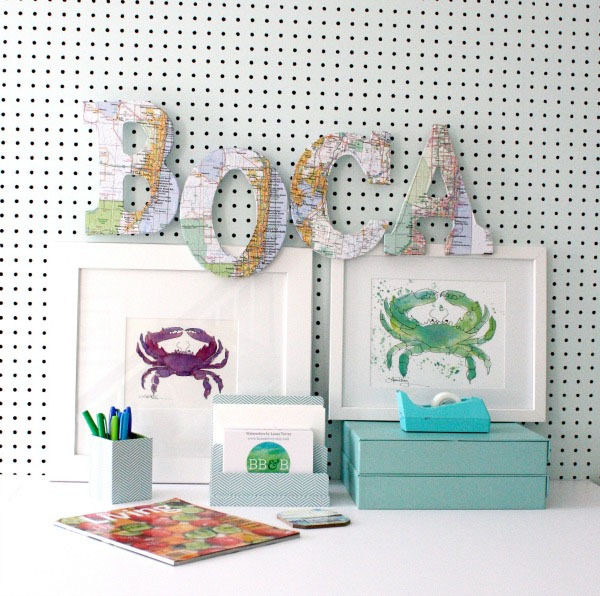 So many clever projects–thank you for sharing @Vintage Charm–pinned! I love maps!! 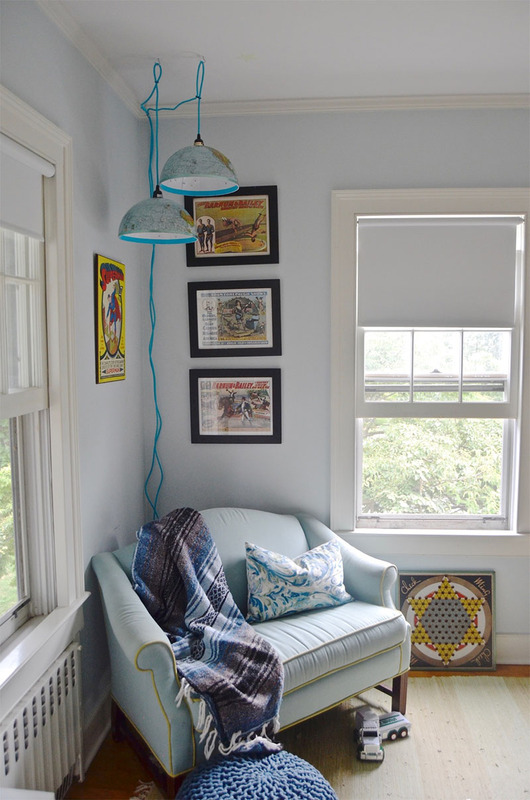 All these projects are awesome but your project with the Ikea lampshade is my favorite! Thank you, that lampshade is very popular. Very cool! Love the desk and the trunk! I love the lamp shade and the placemats! So creative. Thanks for sharing at Funtastic Friday. Thank you, the lampshade is very popular. What a great round up of map projects. I love how they are graphic pretty and they can hold memories as well. Great post! Thank you, I can’t resist a map. I think it is because they are lovely to look at and evoke memories. Love all these various map projects. Maps are timeless and such a fun material to decorate with. Makes me want to come up with some mappy project of my own! Visiting from BOB Tribe. Thank you Victoria, I just love maps. I met up with my sister in London yesterday and managed to pick up a couple of maps.